International children's author and storyteller Bob Hartman has written a brand new series, entitled 'Talking Tales'. Move aside Noah & Jonah, we're taking a look at some of the less familiar, but equally important, characters from the Bible. 'Talking Tales' is a series of illustrated storybooks looking at the stories of Elijah, Miriam, Elisha and Samuel in a way that is engaging for children and young people. The Story of the Boy Hi, you may have heard about me before. I'm the boy in Elijah's story. It's a pretty good one, if I may say so myself. There's a nasty famine, a bunch of ravens trained in waiter service for the ravenous, and something HUGE happens with a little bit of oil and flour. My mum says we have Elijah's God to thank for the way things turned out. But I'll let you find that out for yourself. Oh, got to go! Dinner's ready! About "Yummm!! 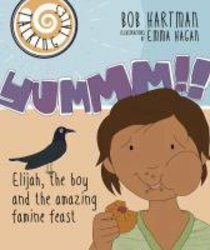 : Elijah, the Boy and the Amazing Famine Feast (Talking Tales Series)"
Bob Hartman is the author of the best-selling Lion Storyteller series and a number of picture book retellings of favourite stories including: The Wolf who Cried Boy and Dinner in the Lions' Den and the highly acclaimed Angels, Angels all around. Sales of his books are in excess of one million copies. Bob divides his time between writing and storytelling in schools and libraries. Arriving in store soon. 0 Available. 0 Available. Expected to ship in 8 to 10 weeks from Australia.